This page was originally designed for Black History Month - February 2005. We are continuing to update our History of Black History Month - and more resources pages as a general resource on Black History. You may also find our information below for Black History Month 2005 an interesting and useful resource. June 2005 Update - QC's Commencement 2005: See the College's news release for information about Commencement 2005 speakers / honorees - Jerry Mitchell and Carolyn Goodman - at http://www.qc.cuny.edu/nis/Releases/viewNews.php?id=159. See also article in Queens Tribune of June 2, 2005 at http://www.queenstribune.com/news/1117734942.html , and article in Newsday of June 3, 2005 at http://www.newsday.com/mynews/ny-nygrad034288436jun03,0,2541892.story . June 2005 Update - Killen Trial verdict: A NY1 article about the Killen trial verdict of June 21, 2005 is at http://www.ny1.com/ny1/content/index.jsp?stid=1&aid=51660 and a NY Times article of the same day is at http://nytimes.com/2005/06/21/national/21cnd-civil.html?hp&ex=1119412800&en=c74e379a2d9644b4&ei=5094&partner=homepage . 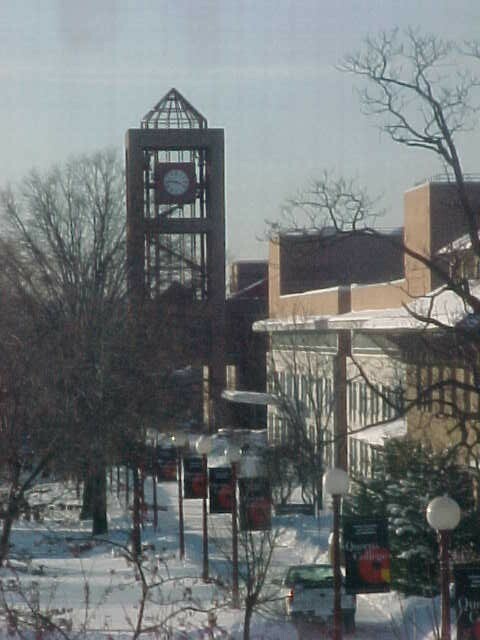 A broad-based group of Queens College faculty, staff and students joined together in the Fall of 2004 as the Black History Month Committee. Co-chaired by Professor Premilla Nadasen (History, and Acting Director, Africana Studies) and Professor Maureen Pierce-Anyan (Minority Pre-Professional Advisor / Counseling and Advisement), this group gathered to plan the program for the February 2005 Queens College observance of Black History Month. The programs that we designed for Black History Month 2005 are specifically * not * designed "For Black Students Only." They are designed for all members of the College community. We hope these programs and events will help foster within the campus community a better understanding of people and events of the time, of each other, and of how it all relates to our lives today. “We have planned the events to take a clear-eyed view of the past, with the goal of building bridges among people today,” says committee co-chair Premilla Nadasen. This Black History Month has special significance for us at Queens College. It is just over 40 years after the Summer 1964 murders of James Chaney, Andrew Goodman, and Michael Schwerner in Mississippi. They were three courageous young men (two with ties to Queens College) who knew that by taking a stand and working together they could make a difference. It is just under 40 years after the May 1965 speech at Queens College by the Rev. Dr. Martin Luther King, Jr., where he emphasized "We've come a long long way, but still have a long long way to go." In many ways and in many other related areas, this is as true today as it was in May of 1965. VOTER REGISTRATION WITH JAMES EARL CHANEY AND MICHAEL SCHWERNER. RETURNING FROM A VISIT TO A RURAL CHURCH, THEY WERE KIDNAPPED AND MURDERED. FOR EQUALITY AND JUSTICE FOR ALL AMERICANS. THHS Ambassador - February 2005 - PTA of Townsend Harris High School - http://staff.thhs.qc.edu/pta/ambassador_2005_02.pdf - page 4 - "From the Humanities Department"
Two of the programs below - the Presidential Roundtable of February 9th, and a film on February 8th and February 10th - focus on Alice Walker's book Meridian. Exhibit: "Black American Women Contributors to the Civil Rights Movement" and "College Students' Contribution to Voter Registration"
Exhibit: "Black History - Local Stories of Struggle, Accomplishment and Contrast"
Exhibit: "The Queens College Library Salutes Alice Walker"
Bring your friends and get the feeling - and start to understand a difficult and different time. Hear CDs of songs and speeches of the Civil Rights Movement, including portions of a speech by the Rev. Dr. Martin Luther King, Jr. at Queens College in 1965. Will open with songs of the civil rights movement. Documentary Film: Alice Walker, 33 min. Film times: Every 35 minutes from 11 am to 2 pm and from 5 to 7 pm. Alice Walker talks about her life, the civil rights movement, and "womanism." Participants: Professor Marie Umeh of John Jay College; Professor Tony O’Brien of Queens College; and Queens College and Townsend Harris High School students. Moderated by Premilla Nadasen, Queens College Professor of History and Africana Studies. Will open with songs of the civil rights movement by Queens College and Townsend Harris students. Reception to follow. Brenda Batista, member of "We Make the Road by Walking," a Brooklyn-based community organization. Documentary Film: Eyes on the Prize, Episode 5, Mississippi: Is this America? 60 min. Persia Campbell Dome. Enter the Dome through the courtyard in back of Powdermaker Hall. Earn CLIQ Points for participation in discussion for 1 hour or more. Film discussion: 2 pm - 4 pm - The Dome. Film focuses on black citizens’ right to vote. Feature Film and Discussion: 4 Little Girls. A Spike Lee film, 1 hr. 45 min. Thursday, February 17, Film Times: 12 noon and 5 pm. Feature Film: Mississippi Burning, 1 hr. 45 min. 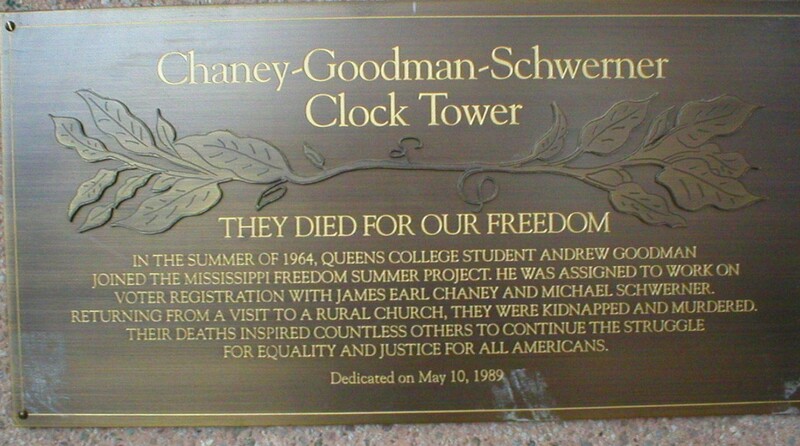 Civil Rights activists Michael Schwerner, James Chaney and Queens College student Andrew Goodman are kidnapped and killed, focusing national attention on the brutality of racism in America. Ms. Robinson will address a Media Studies class open to the public on the state of minorities in the media today, and screen excerpts from “Slavery” and other PBS specials. Tuesday, February 22, Film Times: 12 noon, 1 pm, 5 pm and 6 pm. Documentary Film: Eyes on the Prize, Episode 4, No Easy Walk, 60 min. Explores Dr. King's initiation of non-violent protest and its powerful role in the civil rights movement. Wednesday, February 23, Film Time: 12 noon. Malcolm X. A Spike Lee feature film. 3 hrs. +. A link to the chat area was available here and on the QC Home Page on the day of the discussion. Thank you for participating. The life of black activist Malcolm X. Jazz Feature Film and Discussion: Round Midnight. 2 hrs. Aaron Copland School of Music Recital Hall, Room 226. Film discussion: 3 pm – 4 pm in same room. Earn CLIQ Points for participation in discussion for 1 hour or more. The compelling story of an expatriate jazz musician and his struggles in Paris in l959. Dale, the lead character, is played by renowned bebop jazz saxophonist Dexter Gordon, who earned an Academy Award nomination for the role. Jazz musician Herbie Hancock also appears in the film and was nominated for the film's musical score. Featuring Prof. Michael Mossman, trumpet, Prof. Antonio Hart, saxophone, and students from the Queens College Jazz Program, Aaron Copland School of Music. It has been fifty years since the landmark Brown v. Board of Education Supreme Court decision that legally desegregated public education. How far have we come? Is there truly equal access to public education? What barriers still exist? How has Queens College fared in its attempt to diversify its student body and faculty? This town hall meeting will be a forum for different sectors of the campus and community to come together to address pressing issues about public education and racial equality on campus. Representatives of the student body, faculty, staff, administrators, and local high schools will be present. All are encouraged to attend.